Maybell in Thought of Dolls 2. Haniwa (葉庭, pen-name) is an artist who draws illustration of Touhou. He created his own circle called Haniwa's Store and is where he's able to create his own stories in comics related to Touhou. 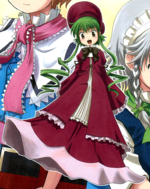 The only thing he got involved in that's official to Touhou is Extra of the Wind within Bohemian Archive in Japanese Red, who illustrated it while ZUN created the story. In his pen-name, "葉" means "Leaf" and "庭" means "Garden", put these together would say "Leaf Garden". He's created himself an original character called Maybell, who appears in Thought of Dolls and it's sequel. She's become very notable by fans. It's suggested that Haniwa is a male due to the various comments in his comic books. This page was last edited on 16 January 2016, at 01:17.